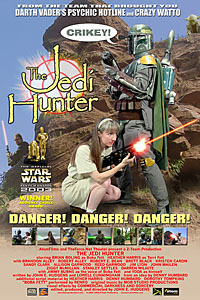 in the 2003 Star Wars Fan Film Awards! The Jedi Hunter is a parody of both the Star Wars universe and the TV show The Crocodile Hunter starring Steve Irwin. Join the now-Australian Boba Fett as he canvasses the galaxy, hunting Jedi whereever he goes... Crikey, there's some feisty ones out there! That's right - Blame the Wookiee!